When we moved into our home three years ago, we had been renting for the three years prior. Three years! The designer in me was dying. I couldn’t paint walls, change light fixtures, nothing. One of our rentals was furnished which was even more difficult. Life had taken us to a project on Kauai…yes “on” Kauai. Hawaiians say “on” because if you are in Kauai, well, you are in the ground. Therefore, I focused all of my attention on my beautiful surroundings and ignored the koa wood explosion in our rental (don’t even get me started on the furnishings). Fast forward to life in Houston. The year was 2012 and I knew I wanted to build a home. My husband, Tony, would forward every existing house that he liked once it came on the market. This went on for months and months until I finally wore him down. We started our home in late 2012 and it really was a dream come true. The floor plan was perfect and we agreed on (almost) all of the finishes. It took about a year to build and during that time I picked out all of the furnishings, lighting and accessories. Well, almost all. 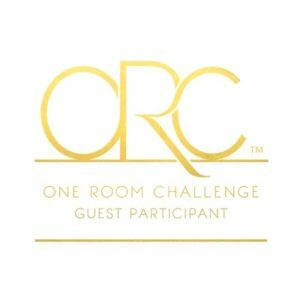 I kept trying to pick out items for the guest bedrooms, but when I showed them to Tony, I would get the same response every time…”I don’t care about the guest room”. UGH! I do care about the guest room!!! And all of the other rooms too! 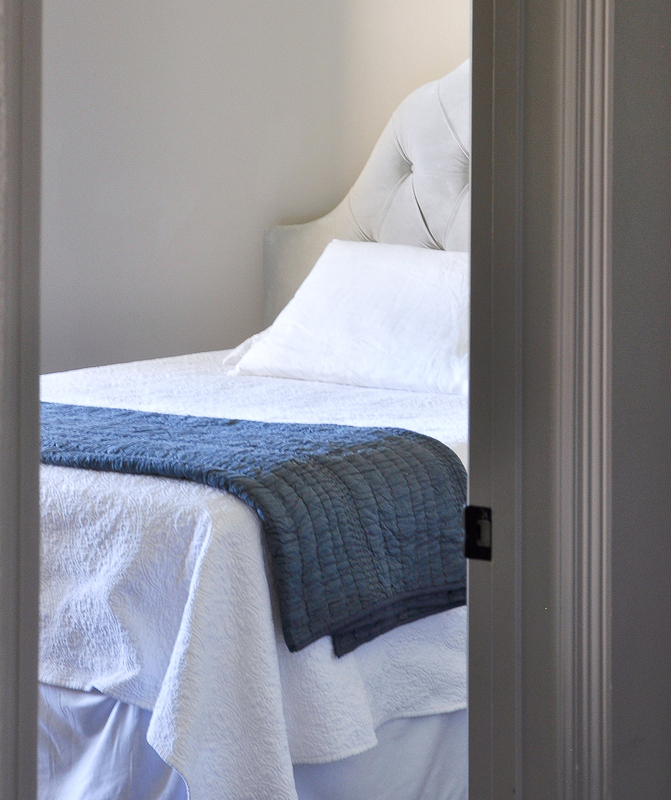 Today, I am giving myself six weeks to transform one of our guest bedrooms. 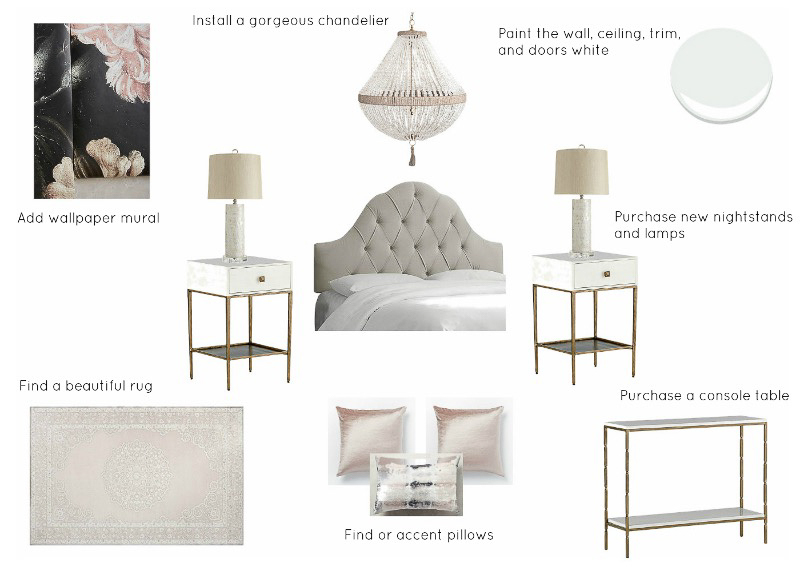 With the help of the One Room Challenge, some amazing sponsors, as well as my family, I’m going to get this guest bedroom in “designer shape!” I’m going to take a slightly different direction than I have with the rest of our home. I can’t wait to hear your feedback and what you think of my plans. But first, the before pictures. This may be the worst bedskirt ever. The current resident doesn’t mind though. 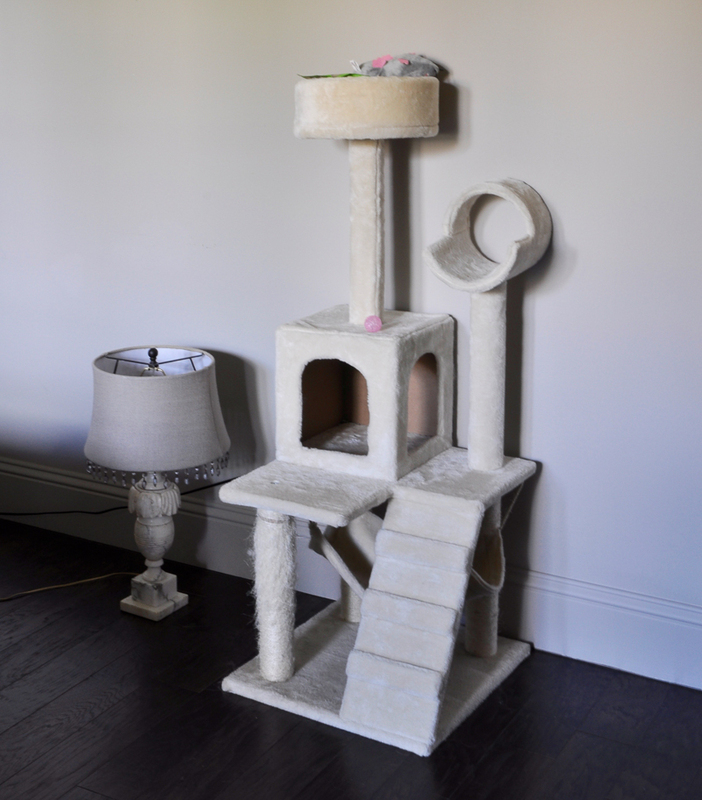 As long as his cat tree is in the room, he’s happy. This is Frankie. 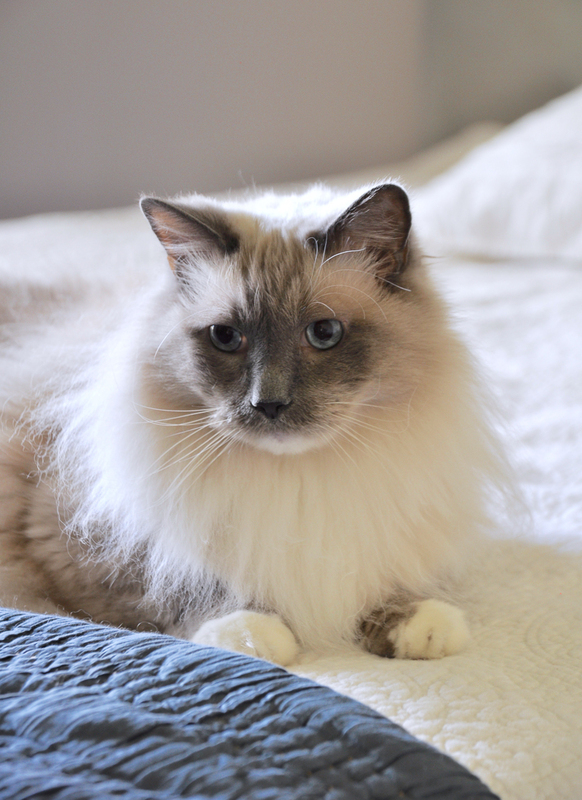 He’s extra cute on the bed though. Back to the room, this is pretty underwhelming, right? Are you ready to see some inspiration rooms? I know I am! I love this look I found on My Domaine. The dark wall is stunning! And the bed!!! 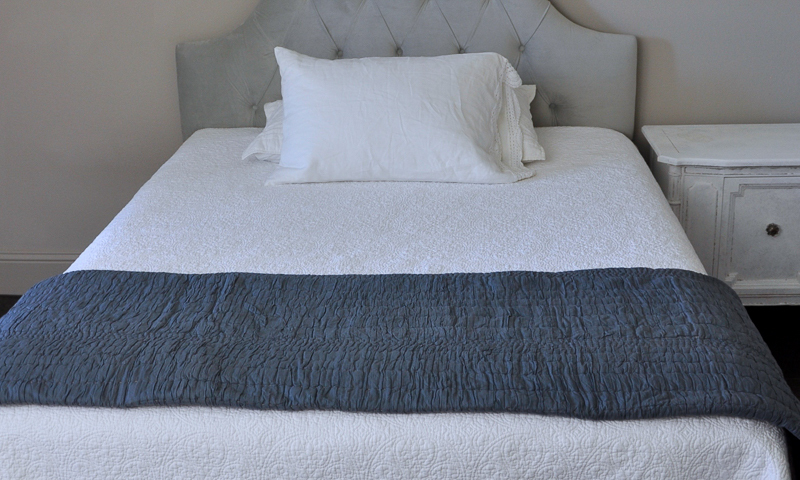 The layered bed offers beautiful details. Once I fell in love with the idea of a statement wall, I found this look. 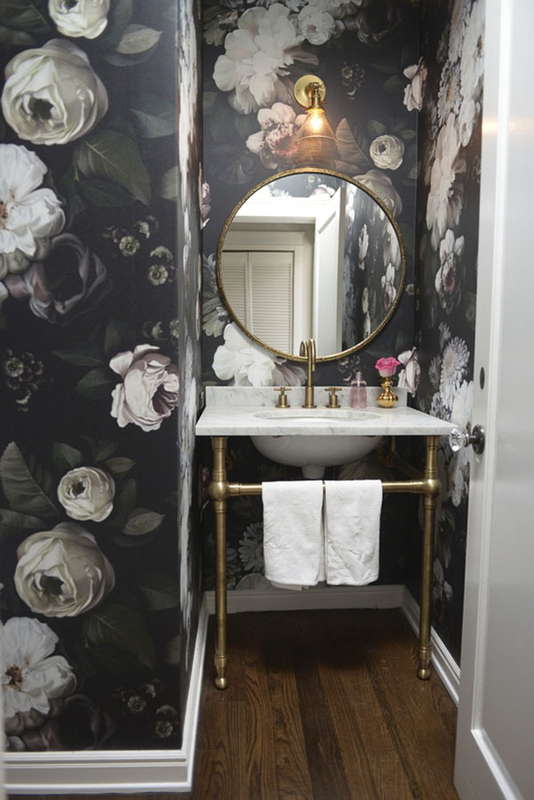 The thought of using a bold floral wallpaper similar to this one (which is shown here in a beautiful powder room by Cupcakes and Cashmere) makes my heart skip a beat. Similar paper can be found here. I can’t wait to show you the paper I’ll be using!!! This room by Becki Owens is quite lovely as well. 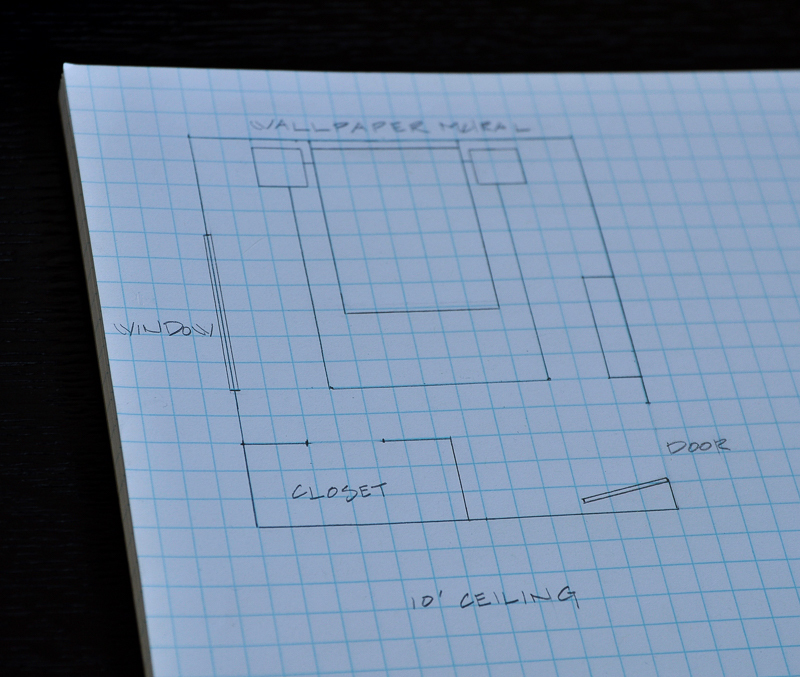 When I start planning a space, I will typically draw out the floorplan. Old school, I know, but quick and easy. 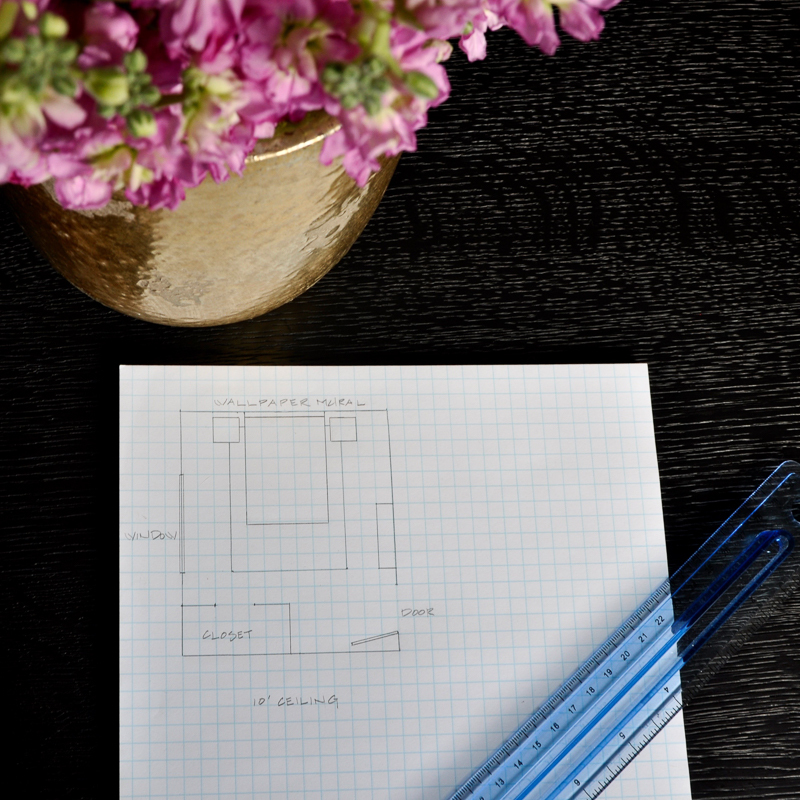 Each square represents a foot, so the room is drawn to scale. In this case, I added some of the furnishings and the rug so I would know the sizes that will fit. So now that you’ve seen the birds eye view, I want to share my vision. Yikes…..looking at the above list, I’m starting to feel a bit overwhelmed! I found this fabulous pillow last week. It’s perfect, but not in my budget, so for now, it’s just inspiration. As you can see, there is a lot of work still to be done. But, when you do something you love, it’s not really work, is it? Be sure and check back next week on Thursday as I will show you the initial progress I’ve made on this room makeover. If you want to make sure you don’t miss a post, please consider subscribing to my newsletter. Jen, I absolutely cannot wait to follow your journey- your plan is so so good and that mural is going to be awesome! Your inspiration images are amazing!! Can’t wait to follow along! Thank you so much Ashley!!! I appreciate your kind words of encouragement! You are going to have some lucky guests who never want to leave. That is one gorgeous plan! Oh I hope so!!! Thank you so much Danielle! absolutely love this decor plan – I’m loving dark accent walls more and more lately! Thank you so much Lauren! I am so excited about the mural!!! It’s a bit outside what I usually do, so I am especially anxious to see it all come together! I can already tell that this is going to be amazing! Love all of your choices – I’m in the market for a console table too so will have to check out Gabby Home because the one you picked is beautiful! Excited to be on the ORC journey with you friend! Thank you so much Kris! That means the world coming from you. I hope I will be able to pull it off! Thank you Bree! I’m so glad you like the plan. The chandy and the wallpaper are two of the items I’m dying to get here! So excited about this one! 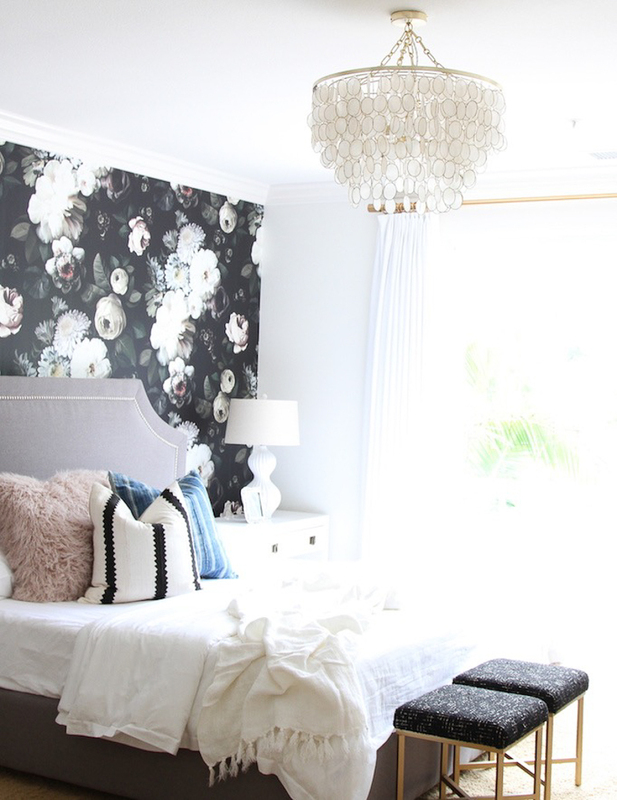 I love the inspiration for the bed wall, and that out of budget pillow is SO GOOD! Thank you Melissa! And I know!!! I’m obsessed with that beautiful pillow! Maybe I can figure something out! Thank you so much Jenna!!! I’m so excited that we get to do this together! Love the wallpaper choice! so bold yet serene. 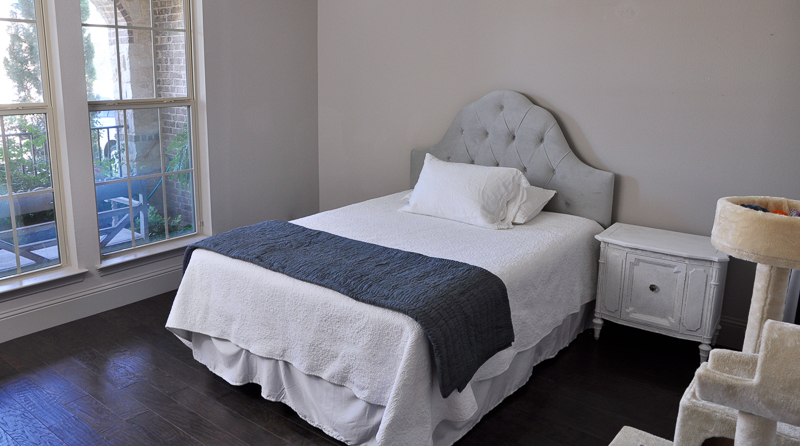 Can’t wait to follow along to see your bedroom coming together! Thanks so much Tim! I’m definitely looking forward to the journey. So glad you stopped by! Looks so beautiful Jen! Love that you are doing a mural – can’t wait to see more! Thank you Brit!!! I’m can hardly wait for the mural to be installed! Okay Jennifer, I don’t know what I’m more obsessed with – your home or your blog design?!? Although on second thought, both speak to your sophisticated taste and great eye for aesthetics, so that’s what I’m going with, ha! I had contemplated wallpapering a feature wall in our own master bedroom, but have yet to convince the husband that it’s a great idea… 🙂 Truth be told, we have far more pressing projects to finish, so it’ll have to wait, but I’ll be paying special attention to how yours turns out – I just might use the “AFTER” photos to convince him! Jennifer!!!! I am SO EXCITED about a mural in this room!! I’ve coveted that Becki Owens paper and bathroom forever! Large scale wallpaper is going to be stunning in this room! Wahoo!! Good luck, friend! Thank you Haneen! I thought you might like it! The Anewall Mural I selected is something I’ve been looking at for a while. I am so glad to finally be using it! Jennifer!! This is amazing and I’m dying with your wallpaper choice. I think it will. be so gorgeous and a huge statement in the room. I can’t wait to see it all come together!!! So fun!! You will rock it! Thanks so much Yuni! You were so kind to help me understand the ORC before I decided to do it! It will be fun to watch your progress too! Oh my goodness I can not wait to see this bedroom reveal. I love love LOVE the color palette you’ve chosen with those pops of blush. Can’t wait to follow this journey with you! Oh Tam! You are so sweet to stop by. I’m so glad you love my plan. I’m anxious for it to come together! Hey there girl! I can’t wait to see what your guest/kitty room ends up looking like! What a fun project! Love your website/blogs. When it’s all done, I might have to come try out that guest room!!! Hi Sammi!!! I was just thinking of you as we watched your Cougs beat Stanford last night! Congrats! Thanks for stopping by my website and for your kind words. As you know, you are always welcome here, so let me know if you want to be the first visitor once it’s complete! Thank you Angela! 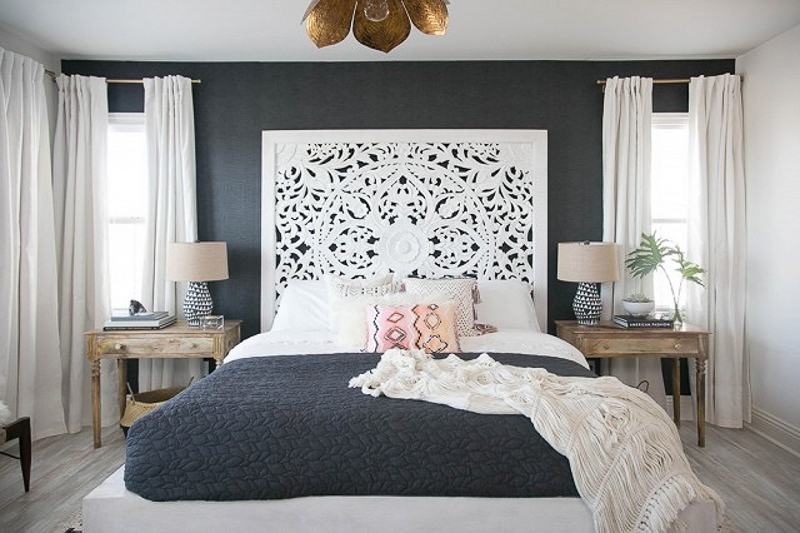 And that headboard….if you find it (and can afford it), I’ll be so happy for you! I read that it’s an expensive piece, but it certainly is fabulous! Jen I’m in love!!! This room is going to be so gorgeous!!! You have such an amazing talent for design and I know this room is going to be one I’ll have to see in person! That wallpaper/mural…stunning! That will make the whole room just beautiful. I can’t wait to see the transformation and will be following along. Thank you so much Lynn! I’m so glad you like the wallpaper! I can hardly wait to get it hung! I actually was able to sneak away for a couple of days this weekend for a much needed break, but now I have some major catching up to do! Thank you Heather! I’m so excited about the wallpaper! Thank you and thanks so much for stopping by! That wallpaper accent wall is going to be everything! Can’t wait to see it come together! It is so hard to wait!!! Thank you so much for stopping by!